The idea for the eventual Norfolk Botanical Garden came from City Manager, Thomas P. Thompson. Because the climate of Norfolk was uniquely suited to azaleas he believed a garden could be created to rival those of Charleston, S.C., which even during the depression drew tourists to their city.  On June 30, 1938, the Works Progress Administration (WPA) awarded a grant of $76,278 to begin the project. It began as Azalea Gardens. Since most of the male labor force was at work with other city projects; a group of 200 African American women and 20 African American men received the assignment. Laboring from dawn until dusk, the workers cleared dense vegetation and carried the equivalent of 150 truckloads of dirt by hand to build a levee for the surrounding lake. 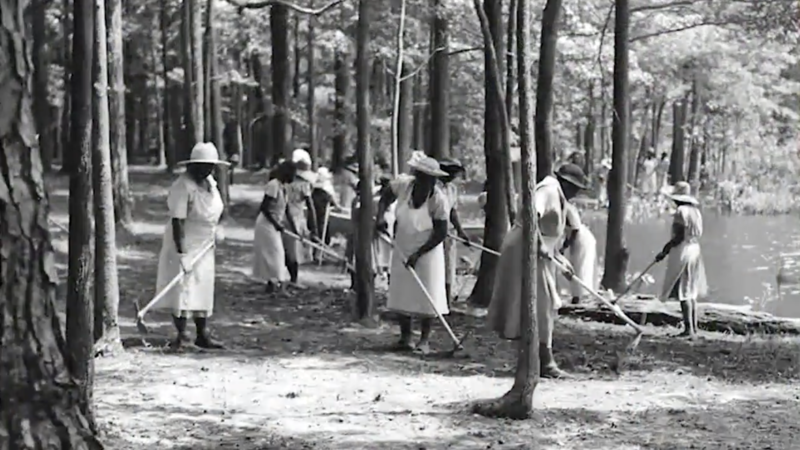 For a period of four years, the 220 original workers continued the back-breaking task of clearing trees, pulling roots and removing stumps. They worked in harsh conditions, long hours during all four seasons, regardless of the blistering heat, humidity, rain, finger-numbing cold, snow or frigid temperatures. They battled snakes, mosquitoes, ticks, and poison ivy. In less than a year, a section of the trees, briers, vines and underbrush had been cleared and readied for planting, using only pickaxes, hoes, shovels, and wheelbarrows. 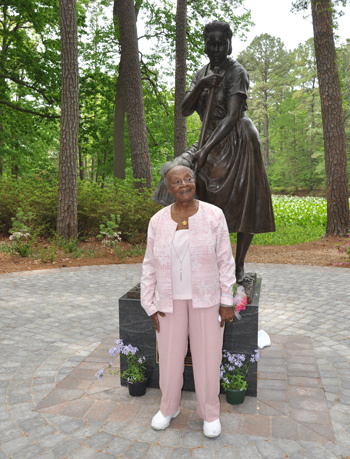 By March 1939, the work had progressed so that 4,000 azaleas, 2,000 rhododendrons, several thousand camellias, other shrubs and 100 bushels of daffodils had been planted. The men and women turned overgrown, swampy acres into a garden that stylistically expressed the national trend of landscape architecture during the late 1930’s. Neither the work nor the pay was great, but it was a means of putting food on the table, which would not have been possible otherwise. For the 220 WPA workers, this memorial serves to honor and remember the legacy of beauty they created for the enjoyment of generations to come. Mary Elizabeth Ferguson – she passed away on April 16, 2017. She was the last known living WPA worker. 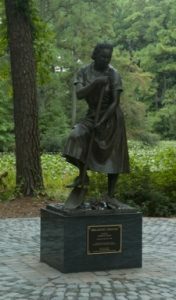 “Breaking Ground” is the design and creation of an original larger-than-life-size bronze sculpture honoring the 220 African-American women and men employed through the WPA Project to labor in the tree-filled swampland from 1938-1942. 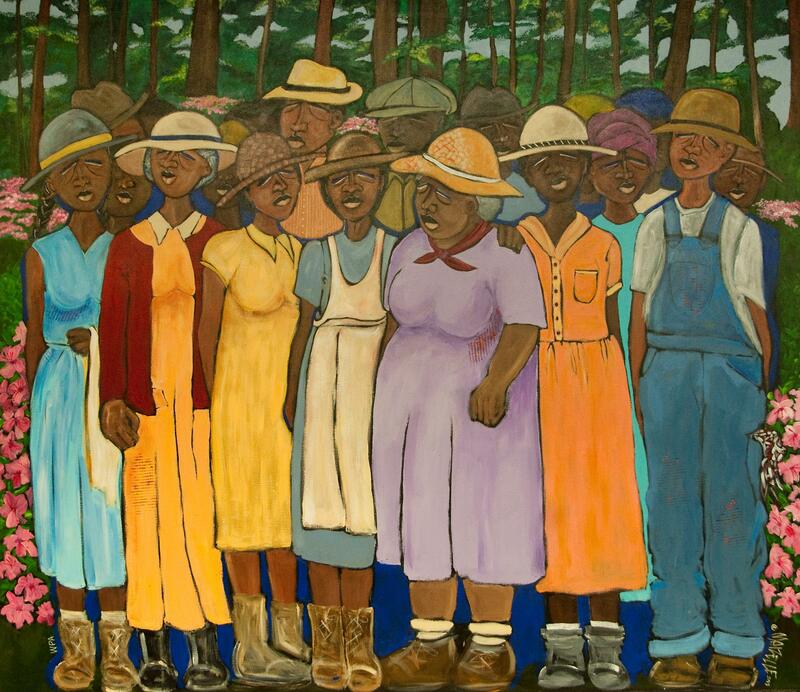 The artist used photos of actual WPA workers from the era and an African-American female model.